As the COO of a multi-store, multi-brand dealership group, what are the biggest challenges that you face today? Growth. At every turn our margins are getting squeezed. Where do you find the extra car deal that will cover those extra expenses? 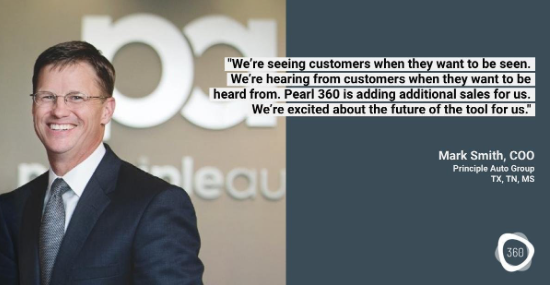 We’re pretty excited that Pearl 360 is helping us do that. You have a few stores that are very young that are in smaller markets, like your Infiniti of Boerne store. What is your approach with those stores, where you don’t have a big existing customer base to work with? It is hard, very hard. Fortunately for us, we have an unbelievable culture in our stores and an unbelievable closing rate that goes with it. The Boerne store is the #1 Infiniti store in the country in terms of proficiency, which is pretty exciting. You measure how good a dealership is by how sales effective they are. We’re 262% sales effective. The team there does an awesome job. You understand technology very well. What problems have you tried to solve with technology in the past that haven’t worked like you thought? How is 360 solving problems in your stores? The problem with technology is that very few things talk together. You might find a neat product that works great, but it only works for this set of customers, but not every set of customers. Or this system doesn’t talk to the system you already have. Therefore you add to the workload of your associates instead of reducing it. It makes it more difficult for them to sell a car, when you need to be making it easier to sell a car. So you ask, where does 360 come into that? 360 being integrated with CDK makes it significantly easier for our sales associates to do their job and do what they love to do, which is engage customers and sell cars. What processes have you put in place at your stores around 360? There is this built-in accountability piece within 360 that holds everything together. The result is that our people don’t want to be known as the ones who don’t do their jobs. My teams are so competitive, and all of a sudden, they love the tool. They are excited about knowing when someone wants a bid, when someone wants to trade-in their car, when someone wants to buy a car. It has been really fascinating watching that shift. Now we are forming a focus group between our stores around 360 to talk about best practices and how to advance the tool even further. What are your goals for 360? We’re buying about 15 cars per month now. By December we want to be buying 40 cars a month. By next year we want to be in the 80’s. Three of our stores are very small, so we have to be very careful that we don’t grow too fast. We could go buy 100 cars a month using 360, but it could break the store. If you had to tell dealers one reason why they should have this tool, what would it be? There are a lot of products out there that drive leads to you. Pearl 360 is a must for a dealer who has a BDC, it’s a must even if you don’t have a BDC, because it gives you accountability. We can measure how many times a customer calls us on the phone and what we did with them. But with Pearl 360, we can measure everything about a customer and how we work with them throughout the life cycle. It’s really quite interesting. If we don’t do our job, a customer will keep asking, and before you didn’t know that. 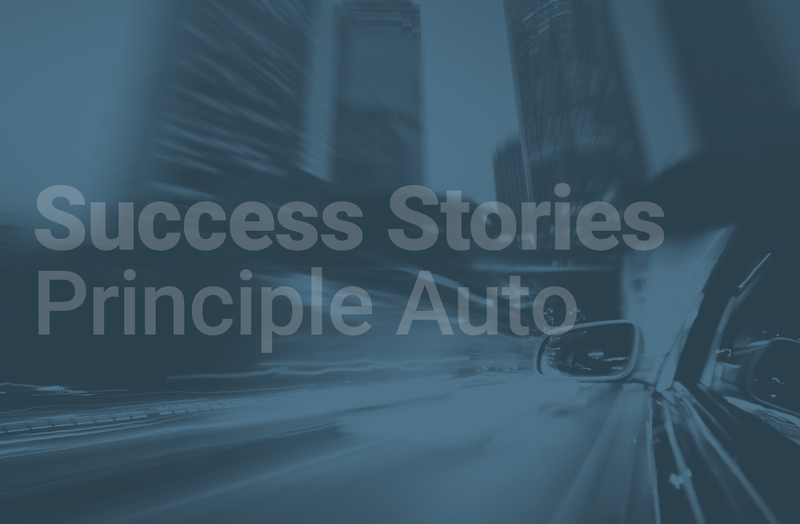 360 is a really great accountability measurement tool that says ‘a customer asked for a quote, we gave them that quote, how quickly we gave them that quote?’ The accountability piece is really special and ties it all together. What results have you seen from Pearl 360? We’ve had 360 in our stores for about 2 months. The results have been good in every market that we are in. We’re seeing customers when they want to be seen. We’re hearing from customers when they want to be heard from. Pearl 360 is adding additional sales for us. We’re excited about the future of the tool for us. What problems does Pearl 360 solve for you? As a dealer, we’re always chasing “what is the next best thing, right? Is there a silver bullet?”. There really is never a silver bullet, its about work. But Pearl 360 gets the customer to me when the customer wants to come to me. It ties into my CDK business, it makes it very easy for a sales associate to take care of a guest, and we’re selling more cars because of it, so its great. How are you handling customers that are submitting their vehicle for a cash offer through Pearl 360? It’s new and interesting for us. It was not something that we were really prepared to handle. 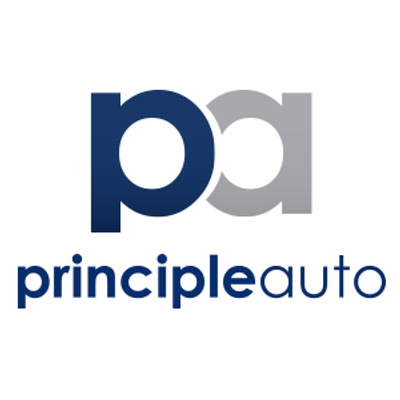 We have tons of customers who are engaging us around getting a price for their car. But were getting better at it everyday and were buying cars, were buying 10 a month now, and by the end of the year we hope to be buying 40 a month. Are you catching customers earlier in the sales cycle with Pearl 360? How has that impacted how you work deals through the system? We are seeing higher grosses and happier customers. The old saying goes, the happier customer is always the one that paid more. Its really because everyone is making a little more money. It’s not like were all getting rich, but now we have a customer contacting us when they weren’t going to contact us before. So we are reaching out to them in a very targeted way and saying “Hey, would you like to sell your car? If we could put you in a new car with a similar payment would you be interested?” And they are saying yes, versus spending their entire Saturday going to a different dealership because they have this car, and another dealership because they have this car. They have really just singled out us because we marketed to them and now were going to have a chance to sell a car at a little higher margin. What do you think of 360’s contact preferences feature? We’re just doing what the customer wants, right? Every marketing company says, “Oh were going send out a gazillion email blasts, or whatever”. If I am a consumer, I don’t want emails, I get 200 a day. I don’t want anymore. But if I say, “Hey, I’m interested, text me”. So now, they are giving us permission to communicate with them how they want to be communicated with. And that’s really the right thing for the consumer. Originally published at www.pearlsolutions.com on September 6, 2018.